A rare find, a delightful cottage nestling on the beach front with panoramic views over the bay and its golden sands. Sleeps up to 6 with three bedrooms on one level. Full central heating and log burner in lounge. Easy parking for two cars, garage providing secure storage for bikes, kayaks etc. Amenities in nearby village. Within walking distance of the Pembrokeshire National Park Coastal Path. Washing line provided in garden and clothes horse (stored in bedroom cupboard). Please bring your own washing powder. Kitchen hand towels and one hand bathroom towel and shower mat.Guests to bring their own shower room/beach towels. Complimentary basket of logs provided in winter months. Light and airy lounge with corner cream leather settee, occasional chair. Flat screen wall mounted t.v. with DVD player above log wood-burner fireplace. Dining table and chairs set in double aspect window corner of room overlooking the beach. Kitchen comprises part of the open plan living accommodation. Electric oven and ceramic hob. Fridge/freezer, Dishwasher: Microwave: Washing machine. Fully equipped with crockery; glasses; cutlery; saucepans etc. Enclosed lawned garden facing beach with picnic bench on coloured stone base for outside dining. There is a local golf course in the holiday resort of Tenby, approx eight miles away. Notes on accommodation: Enjoy your stay at our holiday home on the beach, please treat the property with respect. We do allow up to two well behaved pets, please do not allow them on the furniture or in the bedrooms. Strictly a non-smoking property. Outside: The property has a sizable enclosed lawned garden facing the beach. A few steps lead down the dune onto the beach. The beach can also be reached on a level access along the public route nearby. A picnic bench is provided on a coloured stone base and sun loungers are stored in the garage. A barbecue is provided, please bring your own coals. There is off road parking for two cars in front of the garage. A washing line & pegs are provided. Utility Room: no separate utility room Cleaning / Towels / Linen / Maid service: Bedlinen is provided and the beds will be made up before arrival. Bath mat is provided. Kitchen towels and tea towels are provided. Bath and beach towels are not provided. The property is cleaned between each let. This was our ideal place to be with our two dogs. Lovely, well equipped and comfy cottage. Fabulous view from the garden, straight out onto the beach. At night we left the bedroom window open so we could listen to the sound of the sea. Just lovely. To be able to walk straight onto the beach from the bottom of the garden is such a luxury. The dogs loved it so did we. The cottage is comfy and warm even when a hoolie is blowing outside . Thoroughly enjoyed my stay at Sunniside cottage, superb location. Cottage had everything that made my stay home from home. Coastal footpath is easily accessible and did the walk to Manorbier castle had lunch in the tea room and walked back, rested and just enjoyed the beach mostly as that was my sole intention. However, plenty of places to go if you so wish, information leaflets at the cottage. Lovely complimentary bottle of red wine and Welsh tea cakes on arrival which is a lovely gesture.. Definitely will return and recommend. Comfie cottage in amazing beach side location. Sunniside Cottage is a comfortable stay in a quiet location. It is , however, bang smack on the beach with access through the back gate and a few yards down the dunes to the start of the beach. The views from the garden are beautiful from dawn til dusk. BBQ is efficient and a few evenings were spent on the picnic bench in front of the fire pit which we bought with us. Garden is enclosed but our small and determined Jack Russells found escape routes under the gates. Rooms a good size and beds comfortable. Nearest supermarkets are in Pembroke. As well as Freshwater East there are a number of stunning dog friendly beaches around. A lovely week! Excellent little cottage in the perfect setting amongst the sand dunes. We had a great time at Sunniside Cottage despite the weather not being the best. The cottage is well equipped with dishwasher, washing machine and even has Netflix! We preordered Tescos delivery service to save lugging all of the food along with our 8 year old twins and huge dog! This worked a treat. The dog and the kids had a ball with the beach right on their doorstep getting out at 7am each day for rock pooling while I walked the dog. In the evening you can sit on the garden bench having a glass of wine and watch the kids play on the beach below in perfect safety. There are plenty of other fantastic beaches close by including Barafundle, Broadhaven South (you can walk to via the lilly ponds if you park up at Stackpole). There are no decent pubs in Freshwater East but again plenty close by with Stackpole Inn (great food, lovely setting but the staff appear as though they only work there as their kids are being held hostage, very miserable! ), The Boathouse near Barafundle (not a pub but does nice lunches and it's a short walk to Barafundle beach). All in all a great place to visit in the perfect cottage with excellent service from Sue the owner if you needed anything or had any questions. 3rd year running at the property and will go again . Property lovely and light plenty of room and RIGHT ON THE BEACH. You will have no regrets . 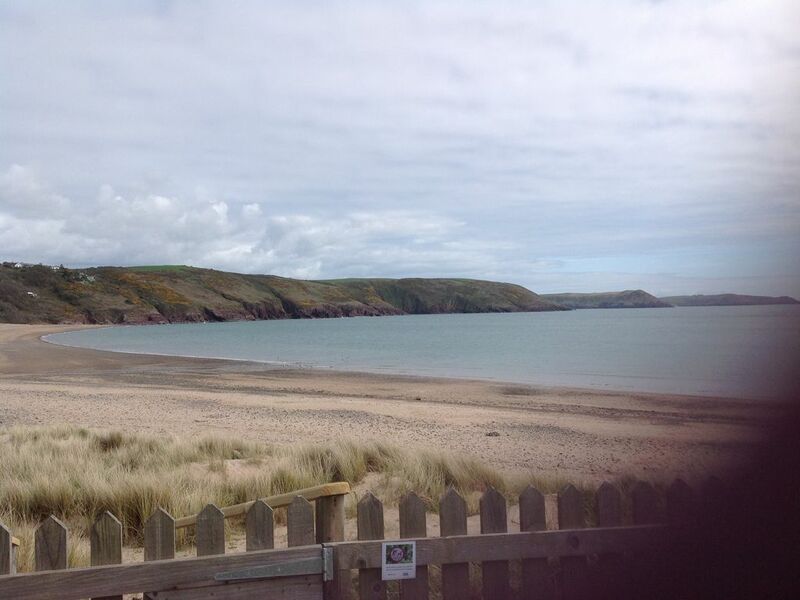 The property is located on the beautiful golden sandy beach of Freshwater East which is safe for bathing and is on the Pembrokeshire Coastal Path for those who enjoy walking and experiencing breathtaking scenery. Sunniside is easily accessible by road, approximately 1 hr 45 mins driving time from the Severn Bridge via M4. The nearby village of Lamphey (2 miles) has a railway station and the National Bus Service calls at the town of Pembroke (3 miles approx). Ample taxi firms are available if using rail or bus services. Sunniside is set in the coastal village of Freshwater East part of the National Park Coastal Path. 2 miles away is the village of Lamphey with its Palace ruins to explore. 3 miles away is the historical town of Pembroke with its maginificant castle where King Henry VII was born. 8 miles approx is the historical and tourist town of Tenby with its many places of interest to explore, a boat trip to Caldy Island not to be missed. Pembrokeshire is full of interesting places to visit. Lamphey village (2 miles away) has its own old fashioned bakery ~ not to be missed! Garage with Spar Shop, Post Office. Church. Hairdresser. Good eating establishments Lamphey Hall Hotel; Dial Inn and Lamphey Court Hotel with its own Leisure Complex. Local shopping can be achieved in the towns of Tenby, Pembroke and Pembroke Dock which has several supermarkets.